The ventilation system is "short cut" when the make up air is withdrawn from the room before it has been in the people operating zones. A "short cut" will reduce the efficiency of the ventilation system, has no mission, and is in general avoided. With a ventilation system based on the mixed principle, make up air is supplied to the room with high speed, and/or local fans are used to mix the air in the room to an homogenous mass. With the displacement principle heat and pollution is transferred from the residence zone close to the floor - to the ceiling where it's evacuated through the outlet system. Make up air is supplied with low velocity very close to the floor. The supply air is normally colder than the average air in the residence zone. The evacuated air close to the ceiling is warmer than the average air in the residence zone. The displacement ventilation system is suited for ventilation and cooling systems. The system is not suited for heating. In a ventilation system based on the piston principle the supply air moves through the rooms like a "piston". 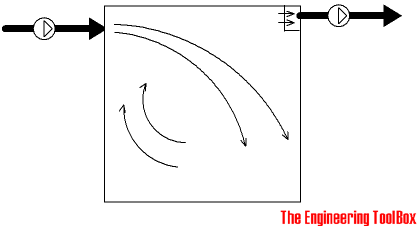 The piston principle can be regarded as an extreme variant of the displacement system with a minimum of turbulence in the air flow passing through the room. used in special applications - like clean rooms, operating theaters etc. Note! 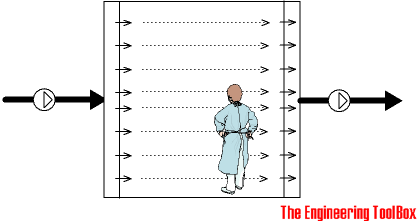 To keep the flow "laminar" and stable the air velocity through the room should not be below 0.25 m/s, which requires relatively large volume flows. 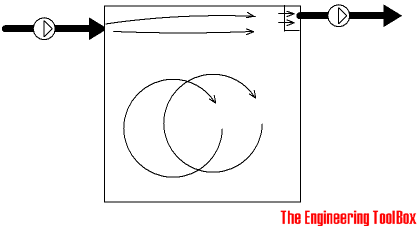 Engineering ToolBox, (2003). 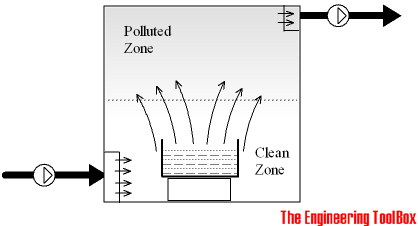 Ventilation Principles. [online] Available at: https://www.engineeringtoolbox.com/ventilation-efficiency-d_124.html [Accessed Day Mo. Year].